BUENOS AIRES, Jun 16 2017 (IPS) - In January 2008, Rosana Galliano was shot to death in Exaltación de la Cruz, a rural municipality 80 km from Argentina’s capital, Buenos Aires. Her ex-husband, José Arce, who was sentenced to life in prison, had hired hitmen to kill her. Nine years later, Arce was put under house arrest, for health reasons, and lives with their children, two boys aged 12 and 13. 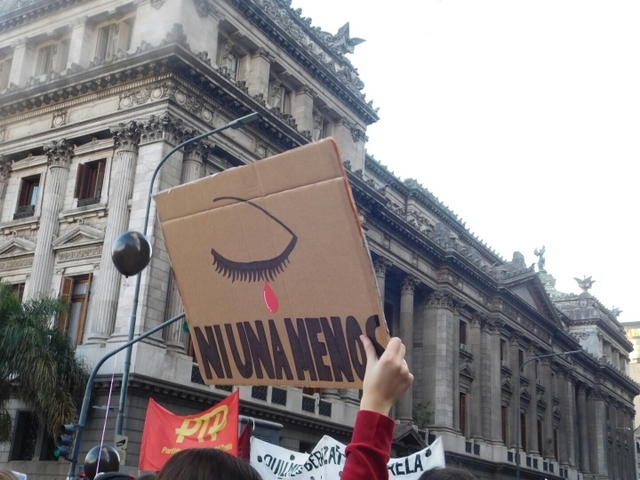 Women’s organisations hold that there are dozens of similar situations in Argentina, where society is becoming more aware of cases of gender-based violence. 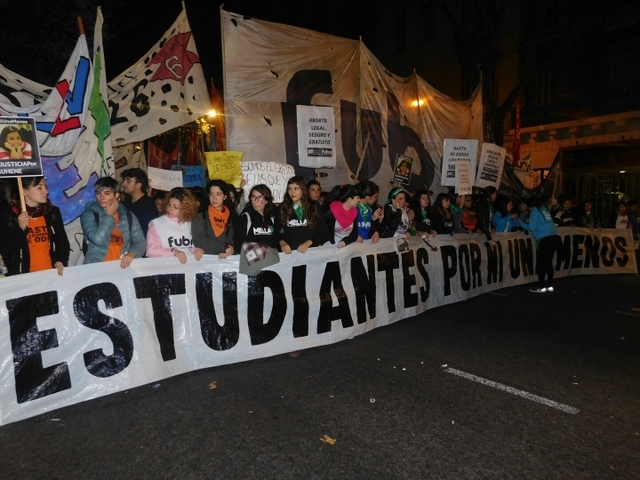 People have responded by taking to the streets: since 2015, an extraordinary social mobilisation, which has continued to this day, has installed the issue on the public agenda and forced politicians to address the phenomenon of the high rate of femicides, the term given murders of women for gender-based reasons. The case of Rosana Galliano’s children was the main catalyst for a law passed by Congress on May 31, which strips parents who kill, injure or sexually abuse their partners of parental rights. “We have received queries about a number of cases similar to that of Rosana Galliano’s children, which don’t make it to the media because the families of the murdered women don’t want to go public,” said Ada Rico, who heads La Casa del Encuentro, a Buenos Aires-based organisation that combats violence, abuse and discrimination against women. In the face of the lack of official statistics, La Casa del Encuentro began in 2008 to gather media reports on gender-based murders of women in this South American country of nearly 44 million people. That same year these murders were officially defined as femicides, during a meeting of the Committee of Experts of the Follow-up Mechanism of the Belem do Pará Convention, the Inter-American instrument signed in 1994 to prevent and punish violence against women. The Argentine Congress followed suit in 2012, stipulating life in prison for men guilty of murders involving gender-based violence. Up to then, murders resulting from domestic violence were treated as manslaughter, punishable with a maximum of 25 years in prison. However, this change did not lead to a decline in violence against women in this country. La Casa del Encuentro’s figures show that femicides have remained fairly stable, at a high level: 255 in 2012, 295 in 2013, 277 in 2014, 286 in 2015 and 290 last year. Among the hundreds of cases, one completely changed life in the town of Rufino, in the province of Santa Fe, and shook the entire country. Chiara Páez, a 14-year-old girl, disappeared one Sunday in May 2015. A large part of the town’s 20,000 people went out to search for her. But eventually the police found her body buried at the house of her boyfriend’s grandparents. Her 16-year-old boyfriend confessed that he had beat her to death. The autopsy revealed that Chiara was pregnant and that she had taken medication to have an abortion. A few days later, hundreds of thousands of people marched through the streets of Buenos Aires and other large cities to demand a stop to male violence against women. “Not one less” (“Ni una menos”) was the slogan devised by a group of feminist activists and journalists, which was taken up immediately by a good part of Argentine society. Since then, huge “Not one less” marches have become an annual event. The last one was held on Jun. 3 on the Avenida de Mayo avenue, and one of the main speakers was Nora Cortiñas, renowned leader of the human rights group Mothers of the Plaza de Mayo. They also demanded an end to discrimination against women in the labour market, and called for legal, safe, free of charge abortion. “Violence against women will not rapidly decline since it is mainly linked to cultural factors very marked in society, such as the greater value put on men in all fields,” Dr. Mabel Bianco, the head of the Foundation for Women’s Studies and Research, told IPS. “We are still lacking answers from the government. A protocol that unifies the steps to be followed nationwide in the face of complaints of gender-based violence must be designed,” she said. One of the results of the social mobilisation was the start of official record-keeping on femicides in 2015. The Supreme Court keeps these figures, and in late May it presented the statistics from 2016: 254 women were murdered for gender-based reasons, 19 more than in 2015. In this year’s report, the Court for the first time differentiated between “biological females” and trans women, who were the victims of five of the femicides last year. Meanwhile, Congress did not stop with the parental responsibility law. The same day it was passed, the Senate gave preliminary approval to two other bills focused on gender-based violence. One of them establishes financial support by the state for women who cannot afford to leave their abusive partners. The other one implements a subsidy for the families who raise children whose mothers have been victims of femicides. The two draft laws are now pending approval in the lower house of Congress.